The Town of Telluride has a town-wide street sweeping program that provides for town streets to be swept approximately two hundred and thirty days a year. This effort removes between 750 and 1200 cubic yards of sediment from our streets each year, greatly improving our air and water quality. The town utilizes two Tennant Company mechanical sweepers. The street sweeping program includes early morning (5:00 am) street sweeping of the Colorado Avenue downtown area on both Monday and Friday mornings nine months a year. The remainder of the streets in town are swept on an as-needed and time available basis. The Town of Telluride strives to be a pedestrian-friendly place. The design, upkeep, and maintenance of the sidewalks in town is therefore important. The Town of Telluride Municipal Code requires that owners of property in town are responsible for the upkeep, maintenance, and snow removal of the sidewalks adjacent to their property. The Town of Telluride's street scape design standards dictate the location and elevation of all new or replaced sidewalks. These design standards have also brought about the return of the ‘historic’ scoring pattern for all town sidewalks. 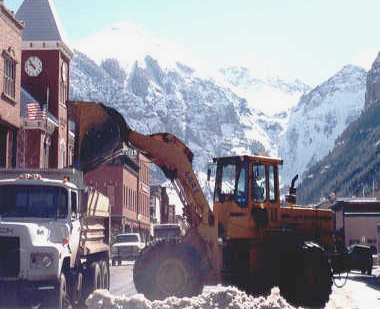 The Town of Telluride Public Works Department spends considerable time and resources plowing and hauling snow within the Town of Telluride. Priorities include both the West and East Colorado Avenue spurs, downtown Colorado Avenue, the Galloping Goose bus loop, school drop off areas, and the bicycle path. Snow plowing is performed on the Colorado Avenue spur whenever there is two inches of snow and around town when there are two to four inches of snow. The town utilizes Ice Ban, a product with corn based inhibitors, on the West Colorado Avenue spur. Gravel is used on the streets in town. View the snow plowing schedule for more information.